Disclaimer: This post may contain affiliate links. Using these links provides a small percentage to me that I use to purchase books for our home and school. Last year I failed at my plans to share about the books I was reading regularly. I told myself that I would do better in 2017. 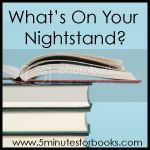 What’s On Your Nightstand is a great way to hold myself accountable, so I am going to try to participate each month. The Readers of Broken Wheel Recommend (Katarina Bivald) – This was recommended on my library’s website. I perused a few reviews and saw it compared to 84 Charing Cross Road (which I loved) and The Guernsey Literary and Potato Peel Society (another book I loved). I had no expectations that this would be a gripping, powerful story. I was looking for a light enjoyable book that used the love of literature as an element of the story. Unfortunately this was a disappointment. The main character, Sara, was not interesting or engaging. While other characters added some life to the story, you never learn enough about them to pull it all together. I cringed at the depiction of “Christians”. The weak pastor who is lead by the uptight town busybody. There is also much focus on various views of appropriate relationships. This is one selection that I can not recommend. I may need to re-read 84 Charing Cross Road. The Lilac Girls (Martha Hall Kelly) – It is no secret that I am drawn to stories set during World War II. Naturally, I had to read Lilac Girls. Lilac Girls brings together the lives a New York socialite, a Polish teenager, and a young, female German doctor. The story travels from New York, Poland, France, and the concentration camp, Ravensbrück. For me. this story lacked a continuity and depth compared to other WWII books I have read. What I found interesting is a fact I realized when I finished the book. The New York socialite, Caroline Ferriday was a real person; her name and work for those ladies that suffered in Ravensbrück was new to me. I wonder if she would be pleased with how she was portrayed? Trouble (Gary D. Schmidt) – Can we go wrong with Mr. Schmidt? I do not think so. Trouble introduces us to Henry Smith. Henry is from a well-established family in Maine. His life is forever changed when his brother, Franklin, is hit by a car. Henry is driven to hike Mt. Katahdin to try to make sense of what has happened. This is a story of grief, hurt, friendship, sacrifice, prejudice, and love. Henry learns that Trouble can’t be kept away. My teens and I all enjoyed reading Trouble. Schmidt has a gift at telling a moving story in a subtle way. As always a bit of comic relief is offered up to balance the emotional impact of the story. I also appreciate books that give some great male characters for me teen son to read. Counting Thyme (Melanie Conklin) – I read a bit about this several months ago and passed over it. Then I saw a review of it at Semicolon and was swayed to give it a go. Thyme, age 12, I think, has to move across the country so her brother, 5, can have cancer treatment. Thyme struggles with wanting to go back home and knowing her brother needs to be here. Conklin does an excellent job of showing the various aspects of Thyme’s relationships, struggles, and emotions. The other characters in the story are engaging. I must confess that I wish I had a Ravioli. It is a sweet story of a family that is facing a serious struggle and need each other to stand strong. An excellent middle grade read. There is a bit of young “romance” that is handled appropriately and sweetly. Just noting that for those who prefer books with no romantic leanings. I have a few more requested but I’m not sure if they will be available in February or not. This entry was posted in Book Reviews, Books, My Reads 2017 and tagged Books, boys, literature, reading, review by sweetie. Bookmark the permalink.